Tens of thousands of people have disappeared in the past few weeks and nobody has been allowed to talk about it but we, here at News of the Universes, are breaking the Silence! We can reveal that all of these innocent people have been tricked into breaking a law that nobody knows exists. Indeed, a law that nobody is allowed to know exists and ignorance is no defence against it. Breaking of this 'law' means an instant charge of contempt of court and the punishment is to be summarily disappeared. At the heart of this disgrace is a shadowy figure known only as The Judge. Several pictures exist of this British High Court Judge, such as the one appearing here, but oddly whenever anyone looks away from these pictures they find they instantly forget they've seen it. 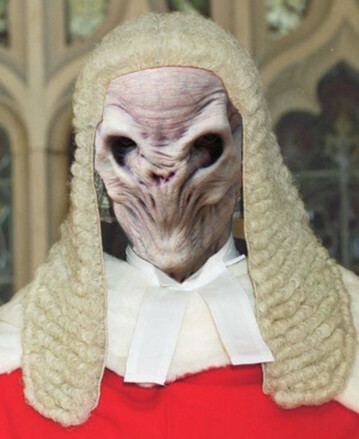 Clearly the perfect face for this faceless Judge. The injunction put in place by The Judge is spoken of only in whispers amongst the few who know about it and refered to as the Super Silence Injunction. Even discussing this injunction is enough to trigger punishment. Worse than that, few people who hear about it remember the details when their thoughts turn to something else. 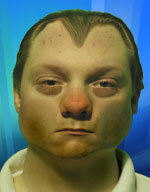 Fortunately for you, my dear News of the Universes readers, I , Alf Roland, appear immune to the effect. Many thousands of people have already been smart enough to use technology to remember for them, instantly posting what they learn on social networking sites before they forget. Most of them do, however, immediately forget the moment they step away from their computers or put their phones back in their pockets. Nonetheless this act of 'civil disobedience' is enough to get the attention of The Judge and his enforcers. Thousands of such people have now disappeared, their social networking accounts shut down and their computers removed. Even their friends and families are not allowed to know why they have been taken or where. It is the silent crime that shall not speak its name. It is believed this all began with an amusing but ultimately unimportant indiscretion by a married football star and a fifteen minute wonder from a reality TV programme. That was enough for The Judge to order an injunction that made it not only illegal to discuss the affair but even to say that such an injunction actually existed. This soon escalated, by means currently unknown, to make it all but impossible for people to physically recall the injunction. Those that can, through natural or artificial means, are targeted by the authorities and disappeared. A small resistance group has grown up, mainly based in Scotland and America, where the judgement does not, in theory, apply. They too, however, are somehow being silenced. One source, who wished to remain anonymous, has told The News of the Universes that the social networking sites themselves are freely giving The Judge all the information he needs to track these people down. Clearly just printing this story is enough to bring down the wrath of The Judge. We hope, however, that enough of you will prove immune to his sinister legal powers and join together to restore our freedom from this Silence. One final word of warning - beware of figures you may sense standing behind you or you may be the next to be disappeared.